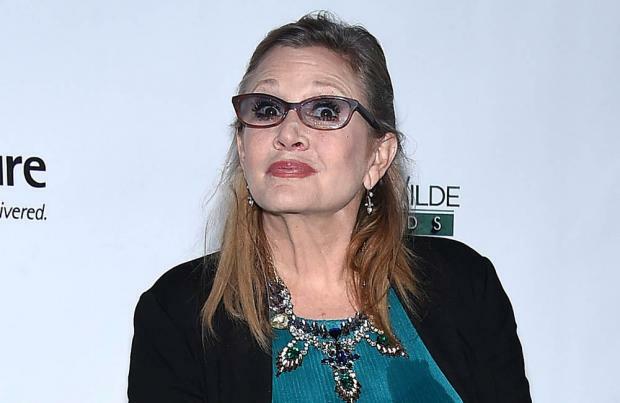 Carrie Fisher was late to the premiere of 'Star Wars: The Force Awakens' on Monday night (14.12.15). The 59-year-old actress reprises her role as Leia in the upcoming latest installment of the world famous movie franchise. But the high security at the world premiere in Los Angeles caused Carrie to make a late arrival onto the red carpet at the TCL Chinese Theatre. The Hollywood veteran kept fans updated about her progress on her social network pages. Posting a picture from her vehicle, Carrie wrote on Twitter: "We probably'll be stuck in traffic thru first hour of film..bomb dogs currently sniffing the car-almost there (sic)." Carrie eventually made it to the event, and walked the red carpet alongside her daughter Billie Lourd. She had earlier shared a picture of herself and Billie getting ready for the event in their dressing gowns, writing: "Check out pre premiere Robe Warriors!" Carrie was joined at the world premiere by Harrison Ford and Mark Hamill, who starred with her in the original films. The trio showed red carpet newbies Daisy Ridley and John Boyega just how to do it as they strutted their stuff in front of the world's media. Security was tight at the premiere as bosses battled to keep details of the film under wraps. Journalists and guests had to hand their mobile phones in before entering the three different screens at which the movie was screened. However, reviews for the film quickly began trickling onto the internet after the premiere. Initial responses appear to be positive, with actress Geena Davis leading the way with a very vocal reaction to the movie. Sititng in the second row at the screening, Geena whooped at the end of the film, telling the rest of the audience: "I loved everything about it!"